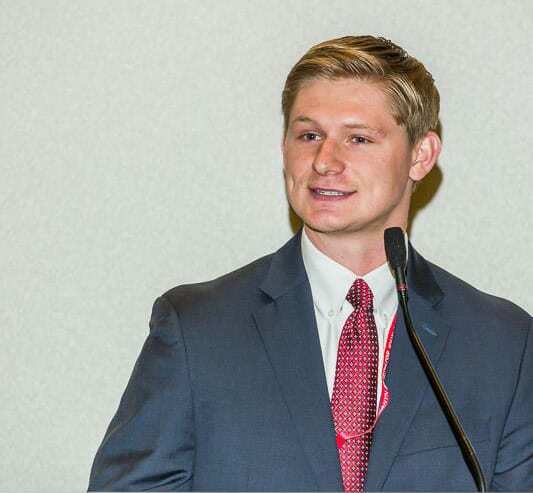 HCM Tower Scholar Drew Wicker speaks to his congressional district at the 2016 Texas Republican Convention. For this month’s Scholar Spotlight we interviewed SMU Senior and HCM Tower Scholar Drew Wicker about his political activism on campus. Wicker is majoring in finance and plans to attend graduate school after graduating from SMU in May. You founded Young Americans for Freedom at SMU and then re-established the College Republicans. Tell us about that experience and how those organizations fit into the campus and your life now. I worked with another student my freshman year to start the Young Americans for Freedom (YAF) at SMU. I served as Vice Chairman and Co-Founder of that organization until my senior year (this year). During my time at YAF the SMU College Republicans went defunct as an organization and, with no one to lead it for the next year (my junior year), I was asked to step in and do a restart for the group. I have served as president of College Republicans at SMU for these last two years, and also currently serve as vice chairman for the Texas Federation of College Republicans (the statewide organization for College Republicans). Both of these organizations have afforded me incredible experiences that have helped shape my worldview. YAF provided me with an insight into activism that I had lacked going into college. College Republicans allowed me to see that in order to create real, sustainable change with respect to promoting one’s personal beliefs, there must be a vehicle for that change (such as a political party). When I took over College Republicans I took the lessons I had learned and the connections I had invested in with YAF and looked to apply them where I saw an opportunity within the College Republicans model. This creativity, adaptability and clear vision has allowed for the building of one of the largest College Republicans in the state (in a very short amount of time) and has allowed me the opportunity to create a 20-student cabinet/board to assist me in carrying out the everyday functions of the larger organization. Now I spend less time focusing on the smaller items and events and more time focused on expanding the size and opportunities that College Republicans offers. The experince provided me with good lessons that can be implemented in other areas of life and has been fundamental to my time at SMU. Where does your passion for politics come from? My interest in politics began as a child. I had a very intense passion for history, and with that, a love for reading. I read a great deal about history and the people that shaped it. Over time this developed into an interest in history, economics, politics, leadership, and technology and examining how they all interact with and shape one another. I was always encouraged to examine the big picture, the 40,000-foot level, of how all these forces interacted with one another. The area in which I saw these factors interacting the most, and found to be in a constant state of change (the state in which I am most comfortable as a person), was politics. Politics, and the policy associated with it, is always an area that can and should be improved, and when selfless servant leaders commit themselves to generating positive change then those people have the ability to significantly shape the world they live in and leave it for the better. That is something I saw in others as a student of history, and something I seek to emulate myself in the future. I don’t know that I necessarily have a “favorite.” I do have a number of figures that I have intensely studied and admired. One of those people would be Winston Churchill. Churchill was a man who faced a great number of personal and political failures before he was essentially handed a situation many expected to be unwinnable. Undoubtedly, his leadership and zeal single-handedly changed the course of human history. Despite his many flaws he rose to the occasion when the opportunity presented itself because he was prepared to do so. You’ve organized several campus events that have brought people such as Carly Fiorina and Steve Forbes to come and speak to students about different issues. Why is it important to you for other people to engage in politics? Most students do not realize that politics is fundamental to every part of their life. Politics, for better or for worse, is involved in education, commerce, the military, healthcare, monetary policy, cultural issues, the rule of law, etc. Students tend to view politics as a bunch of men sitting in a room far away making decisions that don’t affect them. Granted this has somewhat changed in light of the recent election. I believe that it is important that students understand the implications that politics has for every facet of their lives and are able to decide for themselves what policies are best for them. In order to do that students must be educated on both sides of an issue and be able to weigh the merits of a multitude of ideas and decide for themselves. Additionally, I happen to represent an ideological line of thinking that is underrepresented on most of today’s college campuses, so I feel that it is important for me personally to help bring high caliber speakers to SMU’s campus so that a diverse range of ideas can be heard on our campus.